I’ve been meaning to post this picture of the projects the SWAT Team came up with for our April get together for some time now. They are absolutely awesome!!! 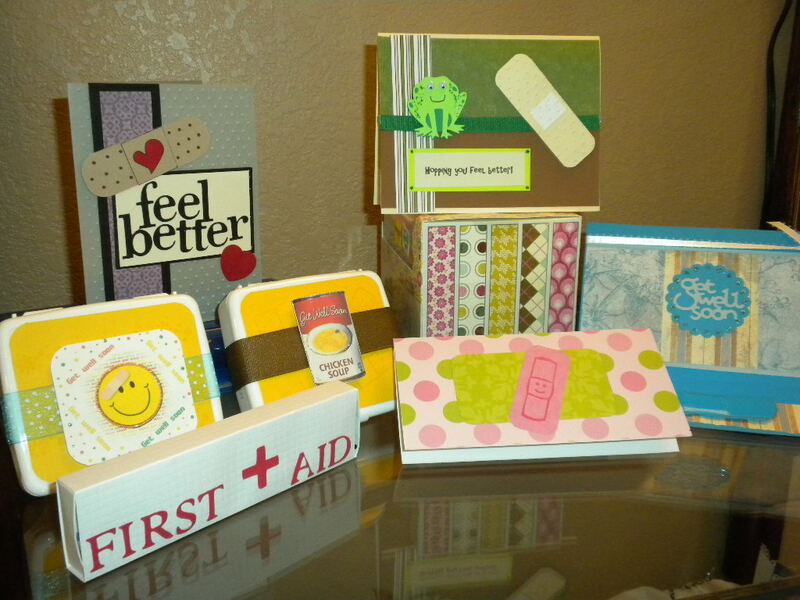 Our challenge was to use “Band-Aids” somehow to make a get well card or gift. We had a couple of different “first aid” kits, one including chocolate along with band-aids (what the band-aids won’t fix, the chocolate will!). One member did an easel card using the band-aid to hold up the easel part of the card, and a newbie to the group did a gorgeous get well card with no stamping at all… just her Cricut! I (unfortunately) didn’t plan very well, and had only made six cards. Well, with having an extra person there, I wasn’t able to keep one of my own cards — no big deal, but that’s why it’s not in the photo. We had a great time (as usual), along with a lot of laughing and stamping. Our challenge for our May project (in honor of Father’s Day in June) is something appropriate for a man or boy; anything or any theme — as long as it’s masculine. So, thanks for visiting! Come back anytime! It looks like you all had a great time! Neat cards! !